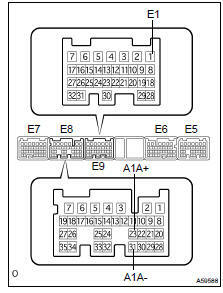 (a) Measure the voltage between the terminals of the ECM connectors. NOTICE: Connect test leads to the connector's backside. The connectors should not be disconnected from the ECM. HINT: Voltage between the terminals of the ECM is kept constant regardless of the voltage of the A/F sensor. (b) Connect the hand-held tester to the DLC3. (c) Select "DATA MONITOR". Then select "A/FS B1 S1", and "O2S B1 S2" to display the monitors. (d) Warm up the A/F sensor with the engine speed at 2,500 rpm for approximately 2 minutes. (e) Keep the engine speed at 2,500 rpm and confirm that the display of "A/FS B1 S1" is as shown in the illustration. The illustration may slightly differ from the display on the hand-held tester. Only the hand-held tester displays the waveform of the A/F sensor. (f) Confirm that the display of "O2S B1 S2" changes between 0 to 1 V with the engine speed at 2,500 rpm. (a) Increase the engine speed to at least 3,500 rpm. (b) Use a sound scope to check for the injector operating noise. (c) When the accelerator pedal is released, injector operating noise stops momentarily and then resumes. If the result is not as specified, check for DTCs. If a DTC is present, follow the repair procedures according to the DTC. (a) Check for cracks, leaks or damage. Be sure to check the areas indicated by the arrow marks. 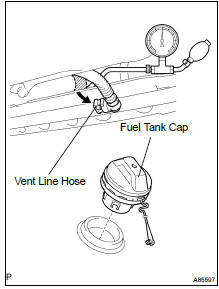 (a) Disconnect the vent line hose from the fuel tank (see page 12-1 1). (b) Connect the pressure gauge to the fuel tank..
(c) Fill the fuel tank with fuel..
(d) Apply pressure of 4 kPa (41 gf/cm2, 0.58 psi) to the vent port of the fuel tank. HINT: It is necessary to check the amount of fuel in the fuel tank. When the fuel tank is full, the float valve of the fill check valve is closed and no air can pass through. (e) Remove the fuel tank cap, and check that pressure drops. (f) Reconnect the vent line hose to the fuel tank. (a) Disconnect the air inlet line hose from the charcoal canister. (b) Check that air can flow freely into the air inlet line. (c) Reconnect the air inlet line hose to the charcoal canister. (a) Measure the power source voltage of the ECM connectors. If the voltage is not as specified, replace the ECM. (b) Measure the power output of the ECM connectors. Install the fuel tank cap.